The SmartSnorkel Full Face Mask lives up to its name, covering your whole face, letting you breathe through both your mouth and nose. With the lowest breathing resistance of any full face mask on the market, you will be more comfortable in the water, letting you do what you love longer! 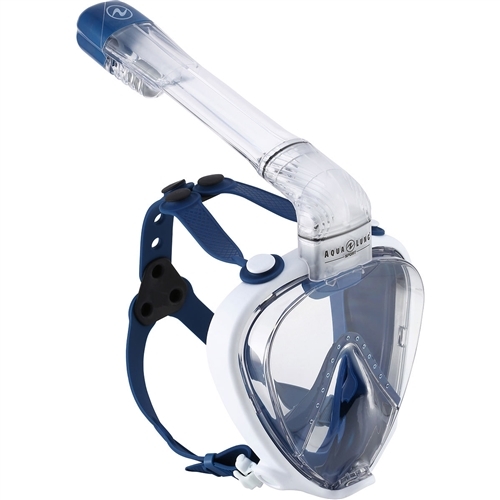 With the Smart-Snorkels dry top design, you won't have to worry about the mask flooding when you dive down to explore! SmartSnorkel dual chamber exhaust system separates exhausted C02 from inhaled air. Hypoallergenic silicone face skirt for ultimate comfort. SmartLock Designed for easy on/off assembly. Low Profile, 180 degree lens for maximum visibility. Fog-Free Unique design prevents build up of condensation. Submersible, dry top snorkel - Designed to keep water out of the breathing tube above and below the surface of the the water. Tri-Pad connectors for a balance and comfortable fit. Smartfit Custom fitting holes for easy adjustments. Ultra-Glide coating prevents hair from being pulled.